Thanksgiving is coming up soon, so that means setting the table with your favorite plates and décor, gathering up friends and family, and feasting on an amazing meal. With so many guests at the house, it can get confusing whose wine glass is whose. Next thing you know, you have half-full glasses of wine everywhere- and no idea which one was yours! And we don’t want a drop of wine wasted, right? 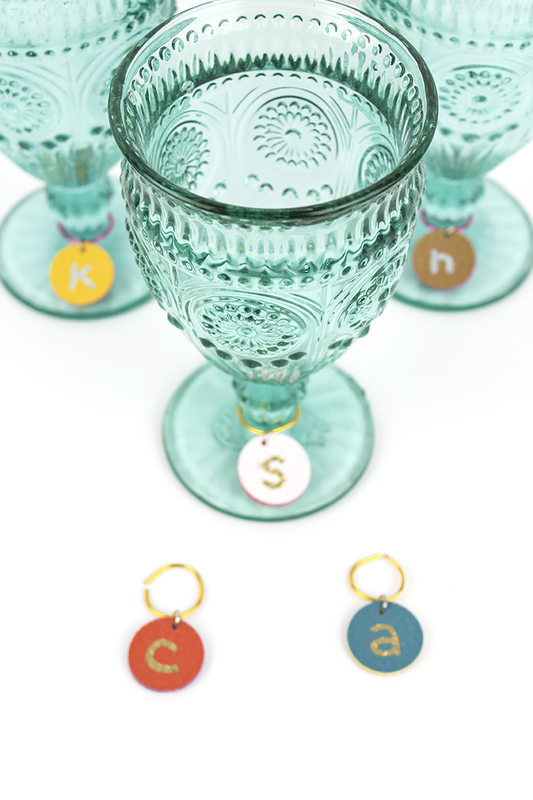 How about creating these easy and affordable personalized drink markers for everyone in the group? They’re perfect for Thanksgiving, and everyone can take them home after. 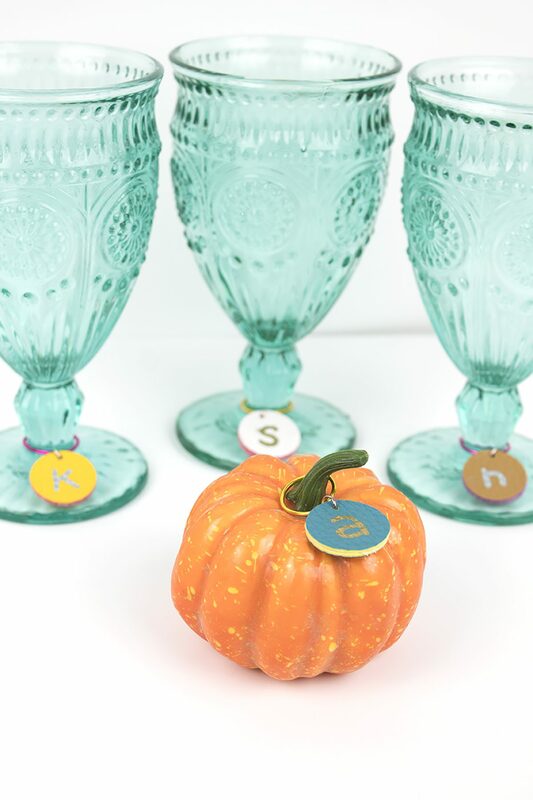 They’ll match any Thanksgiving table setting with their traditional colors, plus teal for a fun pop of color! But, the best part is that you can make them in any color palette you wish. 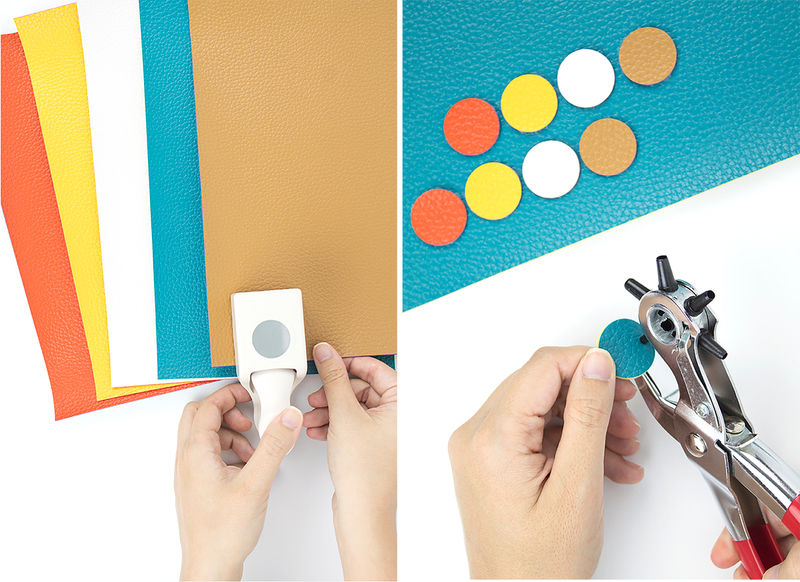 Cut 2 circles of each color of your faux leather. I recommend a circle punch because it leaves nice edges and they’re all the same size, but you can also use scissors if you prefer. 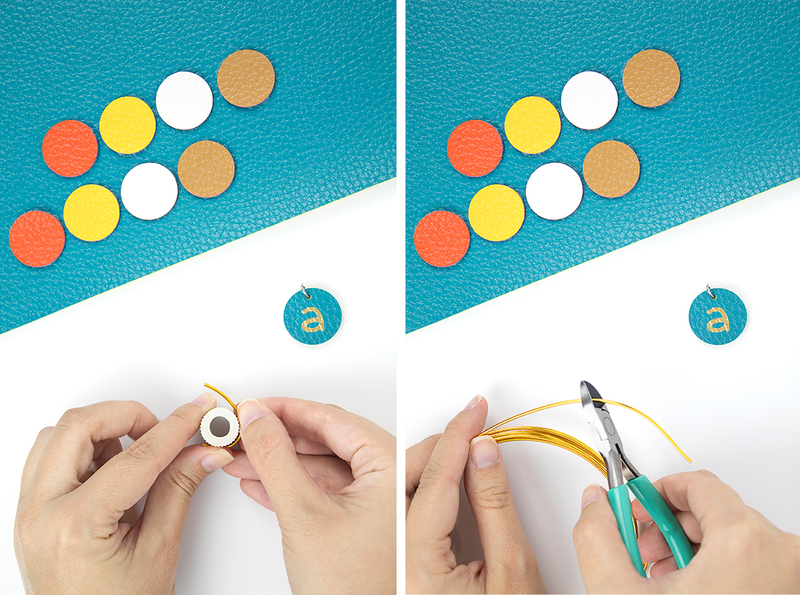 Using your belt hole punch, stack your 2 circles and punch a hole at the top of them. You want each color to have 2 sides that match up so it looks nice and finished instead of having a fabric backing. Thread a jump ring through the holes you punched and close it securely. 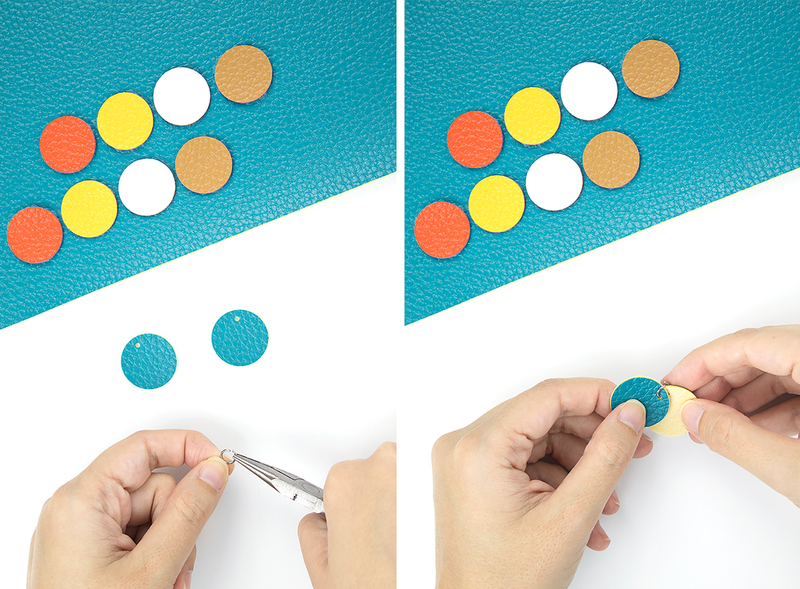 Glue your circles together, ensuring that the hole you punched matches up. Using your sharpie, draw on the letter that you want for your drink marker. You can also use shapes, symbols, or a monogram if you prefer! Cut a short piece of wire and twist into a circle using something round as a guide. Don’t worry about getting it perfect- it’ll be malleable so you can loop it onto your wine glass stem. Thread the rounded wire through the jump ring. Use and enjoy! 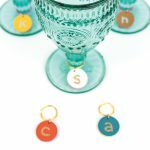 These drink markers are exactly what you need to help everyone locate their drinks through the evening! 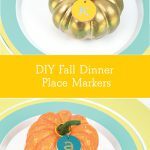 Even if you’re not hosting Thanksgiving, you can make a set for girls’ night, Friendsgiving, or any gathering you have coming up! 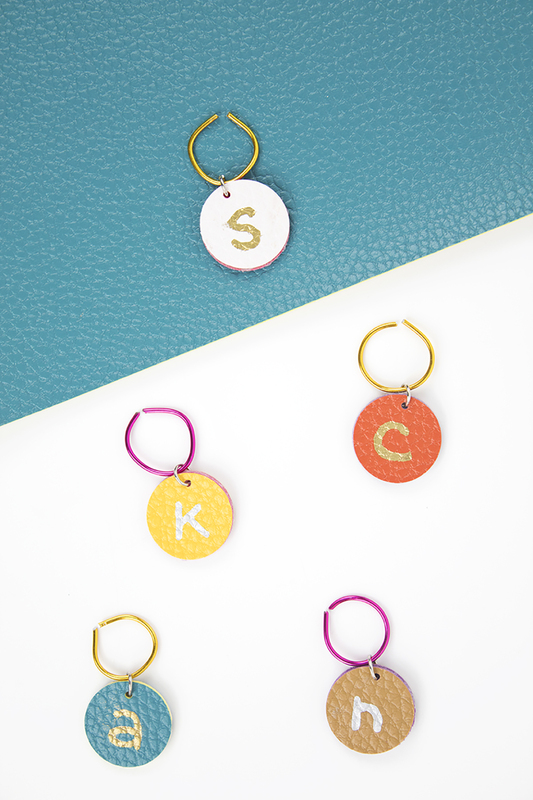 They also make great seating chart décor by placing the charm on a small pumpkin! I’m from NYC, but I recently bought a house and moved out to Long Island with my husband and our 3 cats. 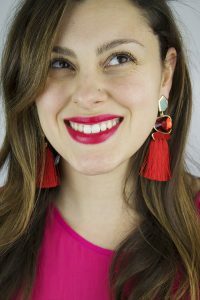 During the week I’m an office manager, but on the weekends I’m a crafter, blogger, and party stylist. I love anything pink, cupcakes, and Disney! I started Party HarDIY (formerly WellKeptChaos) back in April of 2016 with the intention of being an organization and lifestyle blog. Over time, my love for party planning and DIY projects took over the blog, and I couldn’t be happier about the direction it’s going in! You can read more about the way PHD developed here.